When it comes to describing innovation challenges, we can learn a thing or two from Goldilocks. Creative problem solving is at its best when challenges aren’t too big (broad or abstract) or too small (overly specific). Instead, problems need to be framed in a way that maximizes the likelihood of finding a solution – in other words, “just right”, says innovation mastermind Stephen Shapiro. Instead of asking for new ways to increase revenue (abstract), ask employees whether there are specific markets that the company hasn’t penetrated (“just right”). The Goldilocks Principle is truly a search for “just right” every time. And that’s a goal worth chasing. Entering a home belonging to three bears in the woods is not very sound thinking. But Goldilocks slept soundly. There’s a lot of meaning there. Stephen Shapiro is one of the foremost authorities on innovation and collaboration, and has personally touched hundreds of thousands of lives in over 40 countries. 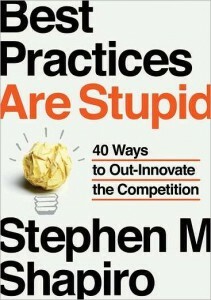 While Stephen’s insights apply to virtually any organization, big or small, he has contributed to shifting the innovation culture for such Fortune 500 organization as Staples, GE, BP, Johnson & Johnson, Fidelity Investments, Pearson Education, Nestle, and Bristol-Myers Squibb. As the founder and creator of a 20,000 person internal innovation practice within Accenture, and advisor to hundreds of organizations worldwide, Stephen possesses a rare and extensive arsenal of tools, allowing him to arm any organization with the knowledge they need to shift their most threatening challenges.